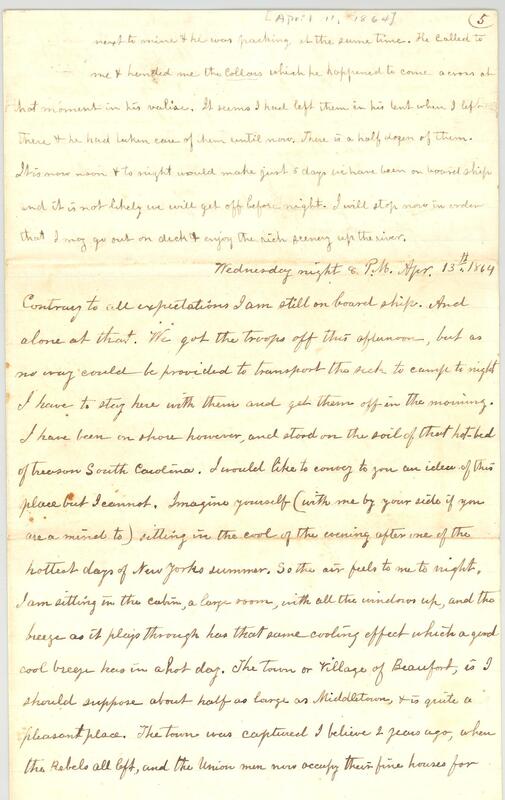 Item Description: Continuation of a multi-day letter that started on 11 April 1864. 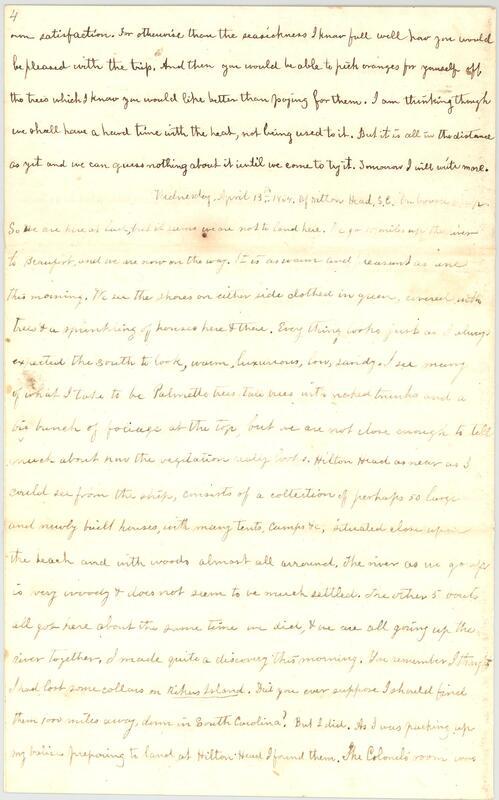 In this letter, dated 13 April 1864, Jonathan L. Whitaker writes to his wife, Julia A. Wells Whitaker, about traveling down to Hilton Head, S.C. and then Beaufort, S.C., about Union soldiers occupying houses of former plantation owners and using them for hospitals and headquarters, and how most houses are inhabited by formerly enslaved individuals. Later that night, Jonathan recalls going ashore stating, “I have been on shore however, and stood on the soil of that hot-bed of treason South Carolina.” Jonathan L. Whitaker, from Orange County, N.Y., was a physician serving as a United States Army surgeon at a hospital at Chester, Pa., and with the 26th United States Colored Troops near Beaufort, S.C. Item Citation: Letter dated 13 April 1864, found in Folder 2 of the Jonathan Lewis Whitaker Papers, #3674-z, Southern Historical Collection, The Wilson Library, University of North Carolina at Chapel Hill. So we are here at last, but it seem we are not to land here. We go [?] miles up the river to Beaufort, and we are now on the way. It is as warm and pleasant as this morning. We see the shores on either side clothed in green, covered with trees & a sprinkling of houses here & there. Everything looks just as I always expected the South to look, warm, luxurious, low, sandy. I see many of what I take to be Palmetto trees, tall trees with naked trunks and a big bunch of foliage at the top, but we are not close enough to tell much about how the vegetation really looks. Hilton Head as near as I could see from the ship, consists of a collection of perhaps 50 large and newly built houses with many tents, camps etc, situated close upon the beach and with woods almost all around. The river as we go up is very woody & does not seem to be much settled. The other 5 boats all got here about the same time we did, & we are all going up the river together. I made quite a discovery this morning. You remember I thought I has lost some collars on Rikers Island. Did you ever suppose I should find them 1000 miles away, down in South Carolina? But I did. As I was packing up my valise preparing to land at Hilton Head I found them. The Colonel’s room was next to mine & he was packing at the same time. He called to me & handed me the collars which he happened to come across at that moment in his valise. It seems I has left them in his tent when I left there & he had taken care of them until now. There is a half dozen of them. It is now noon & tonight would make just 5 days we have been on board ship and it is not likely we will get off before night. I will stop now in order that I may go out on deck & enjoy the rich scenery up the river. Contrary to all expectations I am still on board ship. And alone at that. We got the troops off this afternoon, but as no way could be provided to transport the sick to camp tonight I have to stay here with them and get them off in the morning. I have been on shore however, and stood on the soil of that hot-bed of treason South Carolina. I would like to convey to you an idea of this place but I cannot. Imagine yourself (with me by your side if you are a mind to) sitting in the cool of the evening after one of the hottest days of New Yorks summer. So the air feels to me tonight. I am sitting in the cabin, a large room, with all the windows up, and the breeze as it plays through has that same cooling effect which a cool breeze has in a hot day. The town or village of Beaufort, is I should suppose about half as large as Middletown, & is quite a pleasant place. The town was captured I believe 2 years ago, when the Rebels all left, and the Union men now occupy their fine houses for Hospitals, Head Quarters, and other public buildings. The most of the dwelling houses are occupied by negroes, I suppose the slaves of their former masters who have run away. It must be a remarkably pleasant place to spend winter, they say they have had but one frost here this winter. So if by my usual good fortune I should have a prospect of spending next winter here, you may make your calculations to be one of my party. They say our camp is a mile & a half from the village. When we were ordered here we all expected it would be to go into fighting immediately, but we find that the white troops who were here are leaving to go north, and we are to take their place, from which we are quick to infer that our business will be simply to guard the place, an idea very acceptable of course to all of us. But then we may be wrong in our inference. I find that a mail for New York left here tonight & that it leaves once a week, so I cannot get this scrawl off until a week from today. In the meantime however I can find more news perhaps to tell you. 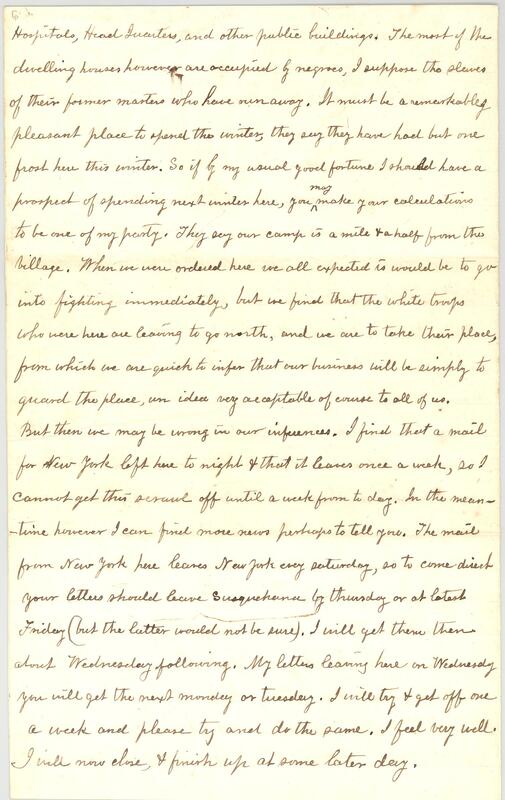 The mail from New York here leaves New York every Saturday, so to come direct your letters should leave Susquehan[n]a by Thursday or at latest Friday (but the latter would not be sure). I will get them then about Wednesday following. My letter leaving here on Wednesday you will get the next morning or Tuesday. I will try & get off one a week and please by and do the same. I feel very well. I will now close, & finish up at some later day.